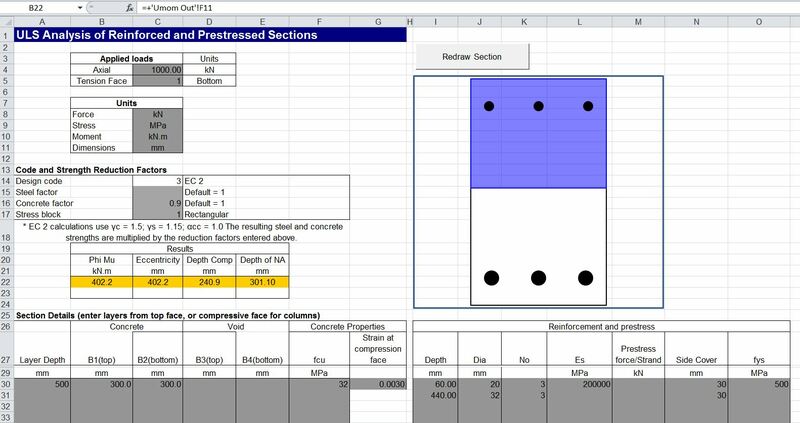 The concrete ULS design spreadsheet last posted at: Concrete ULS spreadsheet update has been updated to fix a problem encountered with non-symmetrical reinforcement using the Eurocode 2 rectangular stress block. Download from ULS Design Functions. Typical input and output interaction diagram are shown below for a simple rectangular section with asymmetric reinforcement. 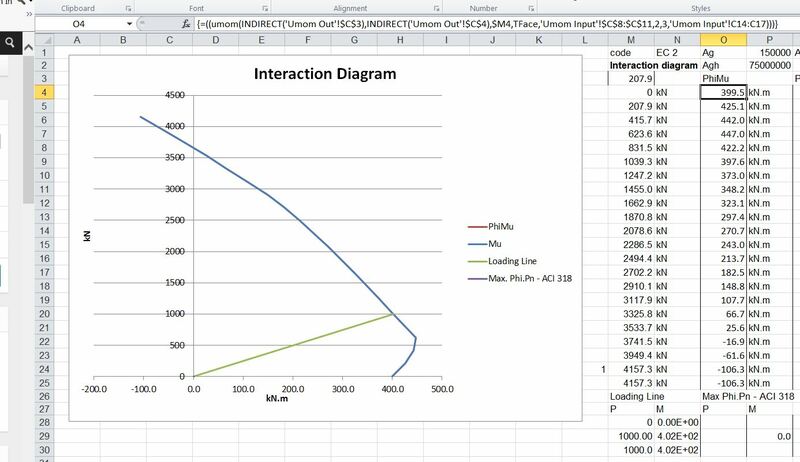 This entry was posted in Beam Bending, Concrete, Excel, Newton, UDFs, VBA and tagged Eurocode 2, Excel, Prestressed Concrete Design, Reinforced concrete design, UDF, ULS Design Functions, VBA. Bookmark the permalink. Not able to download the second update. Not sure if you will see it, since it is so old, but there is a bug in the spreadsheet. When you flip the tension face to the top, it doesn’t pick up the yield strength of the bar correctly (you have to copy the value down in the table). You can check by flipping the tension face on the sample circle section, the moment capacity reduces significantly, when it should remain the same. Thanks for these spreadsheets, they come in very handy when I’m trying to squeeze the last bit out of a section! Thanks for letting me know Michael. All comments get reported when they are posted, so no problem commenting on old posts. Which version of the spreadsheet are you using (see the “about” sheet)? I ask because the download version is 2.04, which doesn’t have the problem, but my development version is 2.05, and has the problem you describe. I have fixed it, but I just need to check I haven’t un-fixed anything else. If you could e-mail a copy of your version to dougaj4 at gmail, that would be helpful.